populating its former sci fi/monster titles with long underwear guys, within a couple of years it brought out two new teams of heroes, one of which, like the one that started the trend at Marvel, consisted entirely of new characters. X-Men, like The Avengers (the other superhero group that debuted with a September, 1963 cover date) was created by Stan Lee and Jack Kirby, the writer and artist, respectively, who were mostly responsible for Marvel's 1960s rebirth. 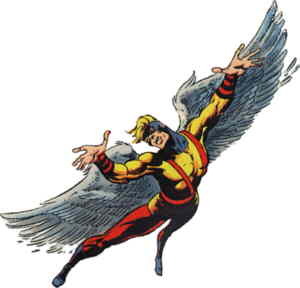 The Angel, one of five team members created for this title, was named after a fairly prominent character Marvel had published in the '40s, but bore no other resemblance to anything the company had done before. He did, however, resemble rival publisher DC's Hawkman, bearing huge, angel-like wings that enabled him to fly. Unlike Hawkman's, however, The Angel's wings were actually part of his body, the result of a genetic mutation, the source of power that distinguished all the X-Men from others of their genre. The Angel's real name was Warren Worthington III, and the way comics characters get their names, you just know the guy had to come from a wealthy family. Shorthand characterization was used for all the X-Men when they were introduced — The Beast used big words, Cyclops was moody and introspective, Iceman was young and playful, Marvel Girl was the token female, and The Angel was a blond-haired, blue-eyed rich kid. Personalities became better fleshed out as the series progressed, but they didn't get very far from their starting point. After the original X-Men series folded, in 1970, the members started popping up elsewhere. The Angel was the first, with a story or two in the back pages of Ka-Zar's first series. He's since been seen mostly in a group setting. In the mid-1970s, he bankrolled a short-lived outfit called The Champions, which included The Black Widow, Iceman, The Ghost Rider and Marvel's version of Hercules. In the late '70s, he was a semi-regular in a reconstituted X-Men. He also had a lengthy stint in the 1980s with The Defenders, and was back with his old buddies when the original X-Men got together to form a group called X-Factor. More recently, he's undergone the usual indignities that befall a superhero who doesn't appear regularly in a series and therefore can be tossed around by writers without worrying about messing with a commercially valuable property. For example, he got his wings amputated and later regrew them. He got brainwashed and became a villain. He changed his name to Archangel. But he's still around, available for graphic novels, mini-series, guest star roles and suchlike, and probably will be for a long time.